It's official: rock'n'roll granddads Aerosmith have postponed their Canadian tour following singer Steven Tyler's live tumble last week. As previously reported, the 61-year-old fell off the stage during a show in South Dakota on August 5, forcing the front-man to be airlifted to hospital, emerging with a broken shoulder and stitches to the head. Aerosmith's next show in Winnipeg was quickly called off after the incident and now a statement from Ticketmaster.ca has informed fans that the band's dates in Canada will not go ahead as originally planned. "The postponed concert dates are a result of injuries Aerosmith lead singer Steven Tyler sustained when he fell from the stage during a show at Buffalo Chip Campground in Sturgis, SD, Wednesday, August 5," the statement reads. "A rescheduled tour announcement is forthcoming for Winnipeg, Regina, Edmonton, Calgary and Vancouver. "Ticket holders are being asked to keep their ticket(s) as they will be honoured on the rescheduled date. Upon announcement of new concert dates, information for ticket buyers that are unable to attend will also be released." Beyond the Canadian dates, Aerosmith's next tour stop is in Settle on August 17, but as Rolling Stone points out, guitarist Joe Perry doesn't seem to have high hopes about the remainder of the tour. "I don't know what's going to happen, when the tour's going to pick up, I've heard anywhere from four weeks to two months," Perry told Illinois radio station WXRX. "I don't know what we're going to do with the tour." 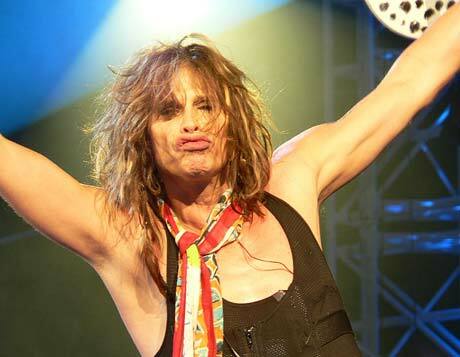 So far, there is no official announcement on when Aerosmith's rescheduled Canadian dates will go down.